CAMI Research Inc. (Acton, MA) announces a new daughter board for its CableEye cable and harness testing systems. Populated with mini HDMI and mini DisplayPort connectors, the boards address the computer video market. Rated to 500Vdc/350Vac, the CB26T may be used on all CableEye models. A leader in development of PC-based Cable & Wire Harness Test Systems for over 20 years, CAMI offers the CableEye suite of Low and High Voltage products complete with accessories including connector boards. The selection of boards is constantly growing and is currently numbering over 60 – most of which are populated with ‘families’ of connectors. 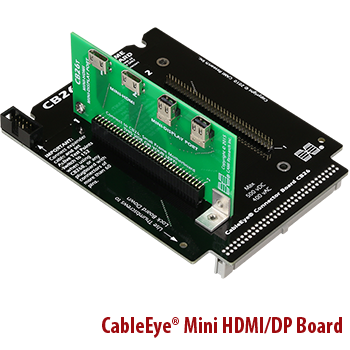 Sold as a set of two boards, each CB26T accepts two mini HDMI and two mini Display-Port connectors. It requires the CB26 small-frame motherboard (Item 756) for operation, and plugs into one of two available slots. The CB26 (with CB26T) attaches to the tester like a regular connector board. Available immediately, a CB26T set is $165 (Item 756T), and requires a CB26 set (Item 756) for mounting.